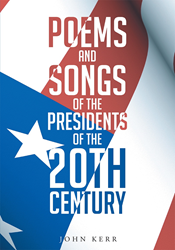 Recent release “Poems and Songs of the Presidents of the 20th Century” from Page Publishing author John Kermit Kerr is a unique and educational compilation of poems that historically narrate past presidents of the United States. John Kermit Kerr, a poet, devoted writer, history buff and author, has completed his new book “Poems and Songs of the Presidents of the 20th Century”: a vibrantly illustrated work that tells historic stories through the art of poetry. Published by New York City-based Page Publishing, John Kerr’s innovative work of poetry is a unique twist to the mundane writings of presidential history. Three men served the eighteen U.S. Presidents of the 20th Century from William McKinley through William Clinton. The first of these men worked for six presidents (McKinley, T. Roosevelt, Taft, Wilson, Harding and Coolidge). His son replaced him and worked for the next six presidents (Hoover, F. Roosevelt, Truman, Eisenhower, Kennedy and Johnson). His grandson then worked for the last six presidents of the 20th Century (Nixon, Ford, Carter, Reagan, Bush, and Clinton). Three generations lived through the century and while serving the presidents in background roles, collected poems and songs written to or by the presidents. These different poetic forms cover successes and failures and recount tragedies and simple pleasures. Combined with paintings by Bruce Johnston, the poems bring life to the presidents which led the country. Readers who wish to experience this profound work can purchase “Poems and Songs of the Presidents of the 20th Century” at bookstores everywhere, or online at the Apple iTunes store, Amazon, Google Play or Barnes and Noble.